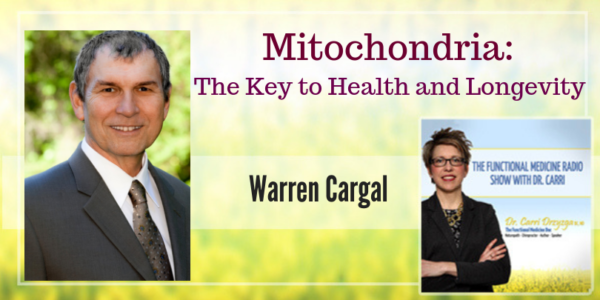 In this episode of The Functional Medicine Radio Show, Dr. Carri’s special guest Warren Cargal explains mitochondria and why they are the key to health and longevity. Warren Cargal is a licensed acupuncturist, herbalist, and clinic director at Acupuncture Atlanta, and has practiced Chinese medicine for over 20 years. Warren’s interest is in the integration of classical Chinese medicine with modern scientific study and evidence-based protocols. He recognized three fundamental factors that drive aging and the age-related diseases of diabetes, cardiovascular disease, and neuro-degenerative diseases like dementia and Parkinson’s. He is the author of, Your Mitochondria: Key to Health and Longevity, which presents approaches for correcting these three factors to reverse age-related diseases. What are the mitochondria? What do they do for us? How are mitochondria a fundamentally huge part of people’s health issues? Why are sleep and fasting important for mitochondrial health? What can we do to make our mitochondria healthier, and prevent these age-related diseases like heart disease, and diabetes and neuro-degenerative diseases? What are the signs and symptoms of probable mitochondrial dysfunction? What role does DNA play? The mitochondria produce energy at the cellular level for our bodies. They’re little organelles, which means small bodies, that exist within each of our cells. Most people’s view of energy is the food that I eat, and it goes through the digestion and broken down into nutrients, and after that, things kind of drop off. But what happens is those nutrients are used by the mitochondria to drive all these cellular functions within the body, which there are millions of them going on. So fundamentally without the mitochondria, you and I wouldn’t be around. There’s about four basic things you need to know about the mitochondria, and you can use those four things today. This really drives the energy production. If you’re really interested in health and longevity, then you’re fundamentally making changes. When I say “fat”, mitochondria are not particular. Whether it’s avocados, whether it’s olive oil, whether it’s fish oils, whether it’s oils from animals. Fat is fat to these cells. Sleeping is fundamental if you really want to have good cognitive health throughout your life. It turns out the lymphatic system actually goes into the brain. And its sole function, how it works, is when you’re sleeping, it removes debris. Debris is one of the precursors for neuro-degeneration, i.e., Alzheimer’s disease and Parkinson’s disease. If you’ve been sitting all day, your mitochondria, this electron transport system, is backed up and it’s full of electrons which are bleeding out into the environment around there and creating inflammatory responses so you move to drive the electron transport chain and to clear it out and to create new mitochondria. If someone with age-related issues like cardiovascular problems or is showing early signs of dementia are giveaways of mitochondrial dysfunction as are eye disease and early wrinkling of the skin. I like that imagery and strengthening the lung function is really important but a lot of the tonic herbs or yin herbs, as we would call them, are discussed in the book and how you can use them to strengthen, and if you’re dealing with chronic conditions, how you can use those herbs to strengthen those conditions. The four things that we talked about, start them today. Start breathing. Get off your desk and start moving around a little bit. Eat a little bit less food and add a lot more fat to it.